The wee infant hours of autumn are always bittersweet. This pie is a way to savor your summer memories while welcoming the new season in a delicious way. 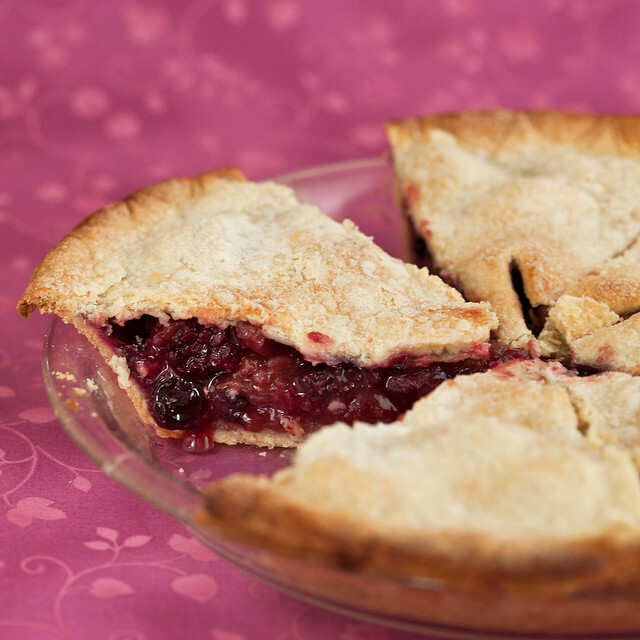 Sweet, tart berries meet lush apples, laced through with some warm spices and all wrapped up in your new favorite pie crust! Made with pantry-friendly olive oil, this is a fast and convenient all-purpose crust ideal for fruit pies. It became mine and Terry’s go-to as we were writing Vegan Pie In The Sky; olive oil produces a light flaky crust with a surprisingly neutral taste that has just a hint of fruitiness. The secret is to freeze the olive oil before hand, so that it become partially solid. This helps the fat to blend into the dough in little pockets, creating the flakiness you crave. Pie season is here, everyone! You’ve got plenty of time to practice for the holiday table. But really, who can argue with pie ever? ~To prepare the olive oil: About an hour before beginning the recipe, place the olive oil in a plastic container; for best results use a thin light container, like the kind used for take out food. Freeze until it’s opaque and congealed but still somewhat soft, like the consistency of slightly melted sorbet. If it’s over-frozen, that’s ok, just let it thaw a bit so that you can work with it. ~Refrigerate the flour before using. That helps to keep the dough cold while you work with it, which will produce a lighter, flakier crust. ~Keep that crust from burning by using a pie shield half-way through baking. This adjustable one is heaven sent! In a large mixing bowl, sift together the flour and salt. Working quickly so that it stays cold, add the olive oil by the tablespoonful, cutting it into the flour with your fingers or a pastry cutter, until the flour appears pebbly. In a cup, mix together 4 tablespoons of the ice water with the apple cider vinegar. Drizzle 2 tablespoons of the water and vinegar mixture into the flour, and using a wooden spoon or rubber spatula, stir into the dough, adding more water a tablespoon at a time until it holds together to form a soft ball. Take care not to over-knead the dough. Divide dough in two, roll each half into a ball and press eachh into disk about an inch thick. Place one disk between two 14 inch long pieces of waxed paper. Use a rolling pin to roll each piece into a circle about 1/4 inch thick. Refrigerate rolled dough wrapped in waxed paper for at least 30 minutes, or until ready to use. Combine the filling ingredients in a large mixing bowl. Fit the bottom crust into the pie plate, pile in the filling, and gently press down to get everything in. Cover with the top crust, pinch the edges together, trim excess dough to about an inch, and crimp. Make five slits in the middle of the pie to let steam escape (a steak knife works great for this). Brush the top of the pie with almond milk and sprinkle with sugar. Bake for 20 minutes. Reduce the heat to 350 F and continue baking 35 to 40 more minutes, or until the filling bubbles up through the edges. Place the pie on a cooling rack and let cool for about 30 minutes before serving. This looks incredible! I can’t wait to go apple picking so that I can make this pie for my surgery-recovering partner. Can’t wait to make this. Do you think the same treatment would work with coconut oil for the crust, or would it freeze to hard? I’m sure it’s delicious with olive oil, but I need to incorporate coconut oil into my diet lately. Thanks for all your recipes! Have you used tapioca pearls rather than cornstarch? Do you have a preference? Do you know if the tapioca pearls would work for this pie? Thanks! I LOVE pie! this is a beauty. If I want to make this ahead of time (and drive a couple of hours), what would be my best bet? Prepare and take with unbaked, or bake and reheat upon arrival? I already have the ingredients, super excited to try this! Loving the fusion of summer meets fall! And thank you for introducing me to the fact that pie crusts are not scary! I have made this as my only pie for the last two Thanksgivings. It is perfect. Thank you for the awesome recipe! I wonder, because I don’t typically like to use oil at all, if I could use something else. Maybe almond milk or cashew milk and make a couple ice cubes out of them to toss into the very cold milk? Nope. Pastry absolutely requires fat. If you subbed something else, it would be soggy/rubbery and…not pastry. We use evoo for all our pastry, sweet and savoury- and yes; somehow it loses the olive oil flavour-well, most of it, anyway. My husband worked out a way of emulsifying the oil with water and it makes a really easy to handle pastry. I like your idea of freezing it though- will have to try it out! @Lynnea, bake & reheat when you arrive. the crust would get all soggy mushy if you just put the filling in it, took it on a road trip, and waited hours to bake it. I’ve made oil pie crust for years but never have used olive oil — made a beautiful cinnamony apple pie last nice — it was very, very good… one more piece tonight! What happens if I don’t peel the apples? I made this tonight and it was amazing. I’ve never used olive oil for a pie crust and can’t believe how light, flaky and crispy it was! Will definitely be making this again. I used Safflower oil instead of olive oil and red delicious mixed with gala apples so I only added a tiny bit of sugar. It’s delicious! I have consistent problems with the olive oil crust, and I’m really not sure what I’m doing wrong as I feel that I’ve always followed the instructions, but it always falls apart on me every time I make it. When I go to roll it out it just cracks and falls apart. I thought maybe it was too dry, but adding moisture didn’t seem to fix it. What could be causing this? Am I taking too long to roll it out so it’s getting too warm? Does it need to be refrigerated longer? The other pie crust in VPitS works fine, but I love baking with olive oil and I wish I could get it to come out right. My cousin tried it as well (trying to make me vegan pie for the holidays so I would have something to eat) and she had similar problems. What are we doing wrong? I made this tonight with some slight changes. Grapeseed oil instead of olive, arrowroot instead of cornstarch and cranberries as the berry. It is delicious! The crust is a little tricky to work with. I had to sprinkle it with flour a few times as I rolled it, but nothing that couldn’t be patched up. Thank you, Isa! Just made this. Oh. So. Good. This was my first olive oil crust and I’m really impressed. This pie is going into my standard dessert offerings. I love that it uses fruit that is plentiful and local in Guatemala. Could I make this pie crust recipe in a food processor ? I made it tonight from Vegan Pie in The Sky. I love it. It’s incredible. I want to eat it everyday! Absolute genius, making olive oil act like a saturated fat by freezing it. It’s not the first time* a vegan dessert turns out better than my omni attempts back in the day. The crust stayed good for several days, too. 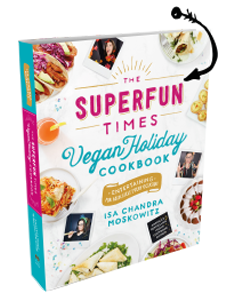 *It’s happened before with Isa’s Black Bottom Peanut Butter Pie and Mark Bittman’s Tofu Chocolate Pudding. Yum!!! I made this with peaches instead of apples because they are in season, and it was so good! I’ll try it with apples in the fall. I must have done something wrong with the crust because it crumbled when I tried to roll it, but I was able to make it work, and it was super tasty. The perfect pie to celebrate Pi day. Thanks for a great recipe!